Recorded on March 25-26, 2011 at Avatar Studio in New York. 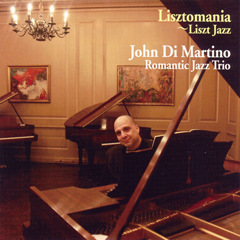 John Di Martino's "Lisztomania" release from Venus Records celebrates the 200th anniversary of the birth of Franz Liszt by "jazzifying" the classic melodies by the celebrated composer and pianist and performing in a jazz piano trio setting. Multiple Grammy nominee John Di Martino–composer, arranger, pianist–has recorded many albums for Venus Records with his Romantic Jazz Trio. Noted for his versatility, John has has been described as a "shape-shifter" for his creativity across musical genres. Lisztomania or Liszt fever was the intense fan frenzy directed toward Hungarian composer Franz Liszt (1811-1886) during his performances. This frenzy first occurred in Berlin in 1841 and the writer Heinrich Heine coined the term Lisztomania to describe the outpouring of emotion that accompanied Liszt and his performances. Lisztomania was characterized by intense levels of hysteria demonstrated by fans, akin to the treatment of celebrity musicians today – but in a time not known for such musical excitement. Liszt's playing was reported to raise the mood of the audience to a level of mystical ecstasy.